1. Preheat the oven to 200°C, gas mark 6. Cook the macaroni cheese according to pack instructions, adding the garlic bread to the baking tray for the last 5-6 minutes. 2. Meanwhile, heat the oil in a frying pan and fry the vegetable mix for 3-4 minutes, stir in the tomato paste and fry for a further minute, season. 3. 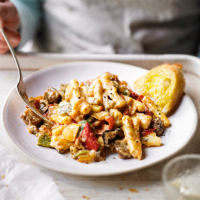 Stir the vegetables into the macaroni cheese and serve with the garlic bread.